Santamedical beautiful kneading massager cushion, with its ultra thin and light weight design, brings steady, relaxing massage to tired muscles. your neck, shoulders and back will sigh with relief when you sooth them with the Santamedical kneading massager cushion. but don’t neglect your legs and abdomen. they will appreciate the kneading massage as well. 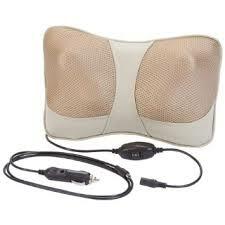 the kneading massager cushion’s shiatsu massage mechanism delivers a relaxing kneading massager just where you need it. can be used for vehicle, office and home setting. a stripe is built in the back of the cushion for convenient mount to car seat.